When receiving a gift from someone, do not be ungrateful. In other words, show some appreciation for the gift. A happy horse chewing on some hay. The origin of this proverb is unknown. However, it sounds like there was a time when, after receiving a horse as a gift, people would literally look into the horse’s mouth. This would be a rude thing to do. But why? And for that matter, why would someone want to look into the mouth of a horse? The reason is because a horse’s age can be determined by inspecting its teeth. Basically, the longer the teeth, the older the horse. 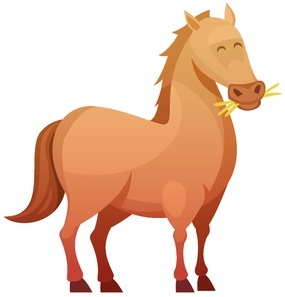 Thus, looking a gift horse in the mouth could be considered rude because the person is essentially examining the horse to see if it measures up to their standards. The implication is that they are checking its teeth to see if the horse is too old. So perhaps this behavior was common enough that people started to be told “don’t look a gift horse in the mouth.” This advice later became a saying that applied to anyone who acted ungrateful after receiving a gift. Of course, since the origin is unknown, this is just speculation. Bob preferred to wear light colored shirts, but his friend bought him a pack of dark colored ones as a gift. Not wanting to look a gift horse in the mouth, Bob accepted the gift and thanked his friend for the shirts. Note: The origin of many idioms is not known. What will be included in such cases is a theory as to how an idiom originated. Or if not that, a quote is typically included on the page that can give you an idea for the expression’s age. So, for example, if I quote a newspaper from 1745 because it used a certain expression, then you know it’s at least that old.